Well, Happy New Year to everyone!! Where did 2015 go? Where did I go? I’m here and there and as always, catching up to life. 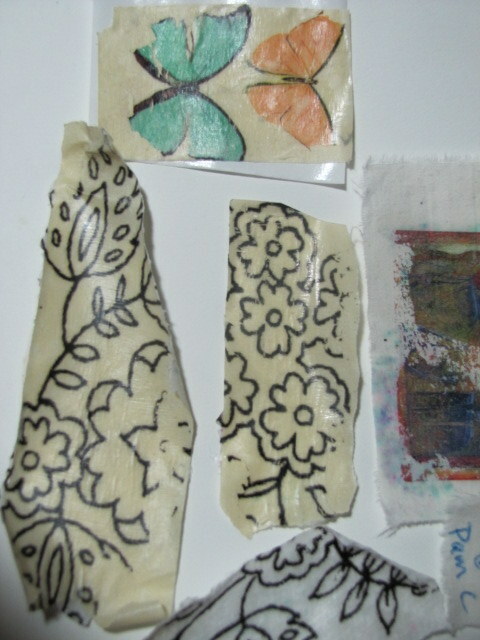 So, as some of you know, I love image transfers. 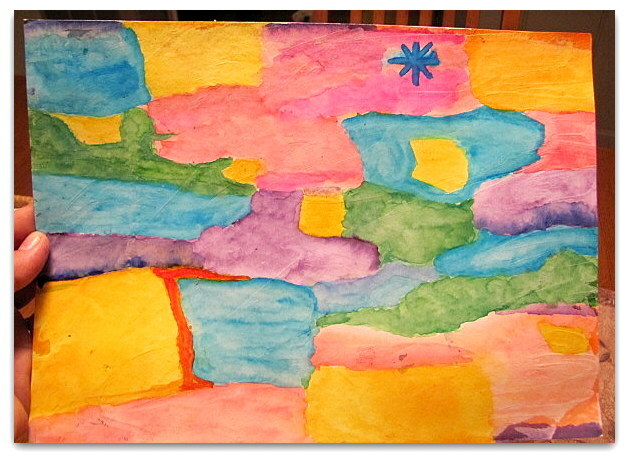 I mostly love transferring them on to soft surfaces, then use them in my art. One of my favorite surfaces are tea bags.. used ones. I’ve done this several times making art gifts for friends, just because. I love sending a surprise gift when they least expect it. Especially if it’s so meaningful to them. Here are a couple pieces I did for friends who had lost family members. I love taken a youthful picture (that I grabbed off of their Facebook page… I’m not a stalker, honest) and transferred the image on a used tea bag or muslin fabric. Surprise little gifts with meaning. These were done on coasters. The one on the left, I was able to capture a hand written note that my aunt gave to her daughter. This was on a tea bag. The one on the right, was a friend’s father. That was on muslin. Since we all drink tea in our house, I have plenty of dried bags to use. My husband is an old fashioned Irishman and drinks the basic Lipton tea. These seems to have the most dying effect that makes a nice vintage/iron look. Let the bags dry with the tea in them. Once dry, cut off a top and shake out the dried tea. Gently pull them apart down the center seam. Some of the berry teas work well, as they leave a purple hint behind. As you can see, I love the catholic icons. Bottom center photo is my parents on their honeymoon in Syria. My favorite transfer method is using clear ink jet printer transparencies. Print them on the dull side. I always rotate my images horizontally. I use polymer medium (not the gel that is thick, the liquid that you can shake in the bottle) to transfer on your surface. It takes a lot of practice and even now, I still do the process a few times before they are completely transferred. If they are not perfect, that’s perfect to me to give that worn, vintage look. These are now ready to put in any of your art. 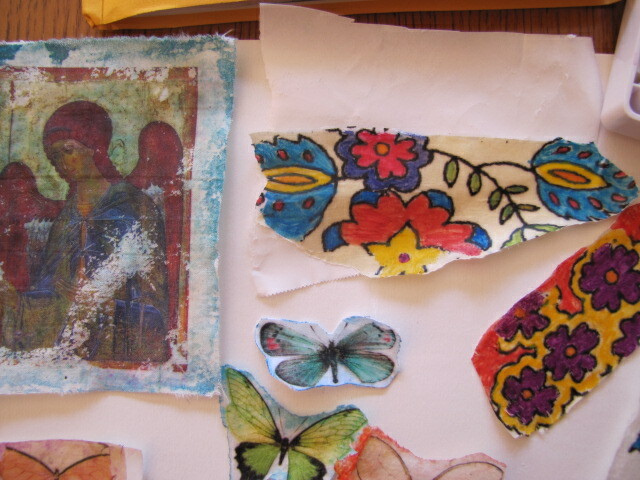 Collages, journals… etc. Below, is a recent wedding gift I was commissioned for. I used tea bags as the first layer. onto a wood board. I transferred the e.e. cummings poem (the bride’s favorite), then the picture of the couple onto muslin. I used molding paste, stencils, acrylic paints and some embellishments to give it a little blingiddy bling. From what I was told, the couple loved the gift. Whew! Well, thanks for checking in with me. I love to hear from you and all your comments. I appreciate them so much. Let me know how you are doing and what you’ve been up to. This week, I decided to give the Peerless Watercolors a try. I purchased them at Art is You from Joanne Sharpe. So, I stopped work early one night (5p.m.) 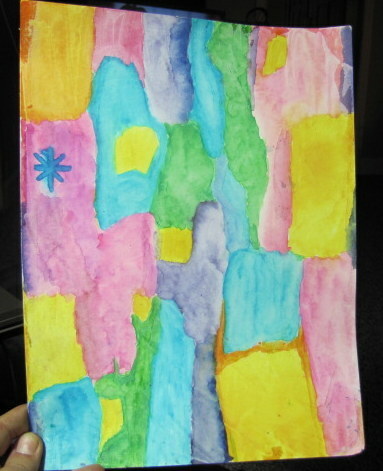 (only one night, but i”m working on more of them) and I put on my jammies and sat myself down to play with the paints. Let me just say what a great feeling it was to kick back and concentrate on my art. Since my daughters are now both in college (help! send money), our nights have a bit more space in them. Funny how fast the time goes and all of the sudden your here, their there and life moves on. Screeeeeeech… halt… Sorry, I got off track. Continuing…. I decided to work on Strathmore Bristol paper and paint in patches all over the page like this… Click on any image to enlarge. Seriously, this page took me a couple of hours. I had fun swiping colors off the “peerless” cards and onto the page. That took time and all with a small brush (water brush by Koi). 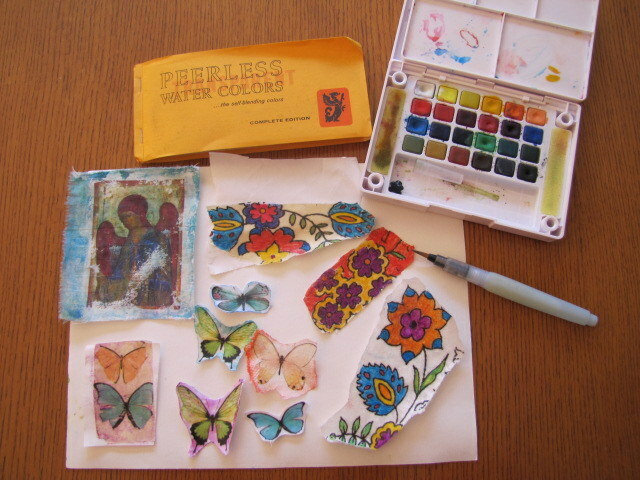 I love the puddling of the watercolors when you use more water. They dry to a nice dark edge. Once I was happy with the background, I gave it a spray of PYM (Preserve Your Memories) to seal it. You can see it deepens it a little. I took this picture under a normal light bulb. The top picture was taken under an Ott Lite. So, my fine friends, I took it to my studio and scraped some gesso all over it (that’s why I had to seal the page first, otherwise the colors would have mixed), rubbed it off, then buffed it dry. 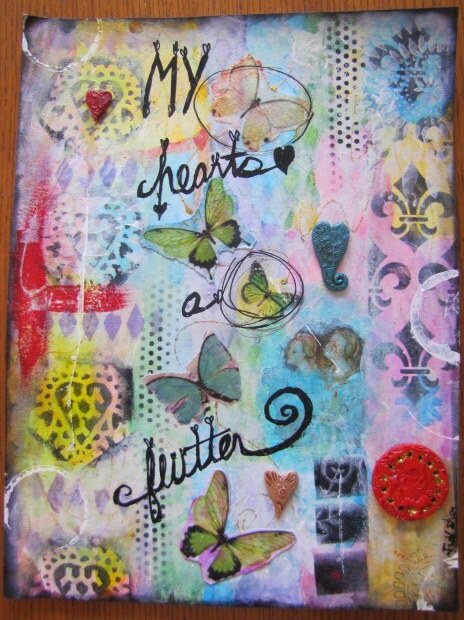 Used black Staz On ink and a make up sponge with stencils (from Stencil Girl and Mary Beth Shaw = LOVE). Added stamped, hand made foam stamps and of course some of my polymer clay ‘bellishments. 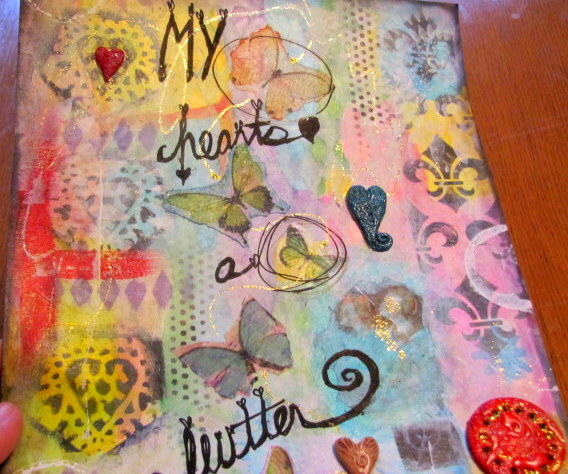 One of the parts I love the most, are my image transfers; the butterflies and the two women, under my teal heart..
Below, you can see some gold glitter trails it put in. I get so lost in time when I am doing image transfers. My favorite combination to make a perfect transfer is a transparency film and gel medium. I did a few tests using different mediums and my best result was Golden Gel Medium. I have not tried Liquitex, but I will someday. 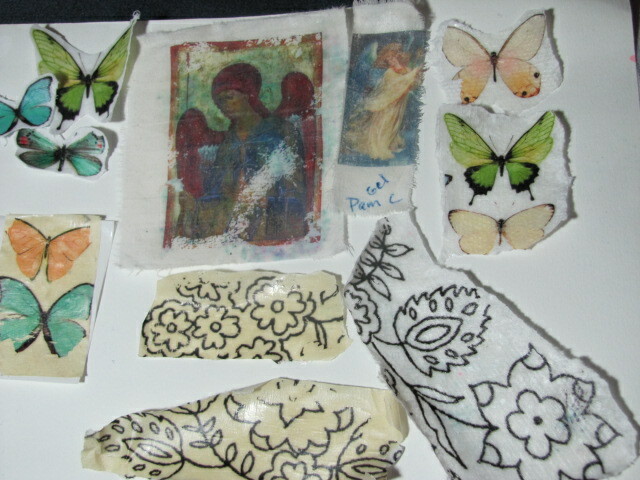 I transferred on muslin and cotton fabric, paper towel, masking tape and I did a packing tape transfer also. I got the images from Dover Clipart which is copyright free. You can join their mailing list and they will send you samples every week. Click on THIS LINK and put in your email address. You will get samples every week. If you like them, you can save and download on your hard drive on your computer. Get yourself some transparency film. Maybe you know someone who might have some or you can split a box with a friend. I had some old Lexmark ones and some I hadn’t used even after I printed on them months or years ago. You want to print on the matte side, not shiny. Your best bet is to print a bunch of images on one page. You can use Microsoft Word or Powerpoint to insert an entire page of images (please email me if you need help with that.). This is my method. There may be other ways, for example, using a photo software would also work. Spread some gel medium on the surface you want to transfer to and on the image itself… gently, you don’t want the ink to rub off. Use the consistency of spreading butter on bread. I use my finger to spread the gel, as I don’t want any brush line. Lay the film with image face down on the gelled up surface and rub it down with your finger in a circular motion, working from the center and making sure your reached all around the image. Now wait 5 or 10 minutes or even longer.. overnight even if you need to be away. But, if you’re like me, you ain’t going nowhere and you want instant results. After you’ve waited and I hope you were patient, peel up the film slowly. Check a corner and see if the ink is now transferred to the surface. If it did, then keep slowly peeling it off. Did it work? It works 99% of the time for me. I give the images a spray seal of the PYM so I know they will keep their color and last a long time. 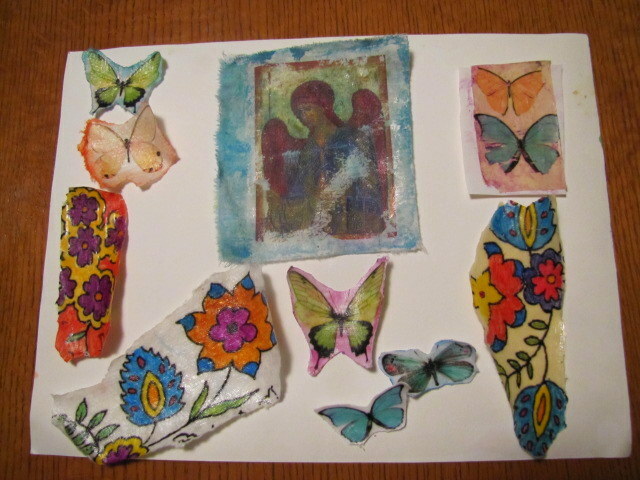 I made a bunch of image transfers on muslin fabric for my mom who loves her religious (catholic) books. She wanted angels so she could sew them to her fabric covered books. She was just in love with them. I’ll be using my masking tape painted images on some other art; I wanted to use them on this page, but it didn’t seem to match. Hope you enjoyed this post and I want you to try the image transfers and let me now how they come out. And always… thank YOU for stopping by and leaving some blog love.